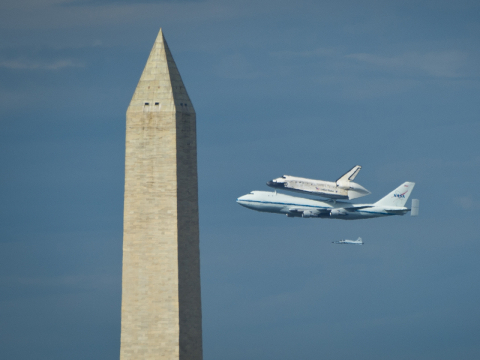 Discovery and Enterprise cross paths in Washington. In October I am heading to New York and Washington D.C with my sister to tour my favourite places for the first time. But here is the clincher. I am going to see not one, but two Space Shuttles, and when I realised this I actually started to cry. After I got over the flow of emotion that came with this realisation, I started to think about their legacy and what they represent in history. Over the last month the East coast has seen two of the fleet fly over their national monuments on the back of a 747 as they make their way to their new homes. The space shuttle Discovery made its final journey in the sky, as it was flown from Florida to Washington D.C, where it will become part of the Smithsonian Museum’s space exhibit. Discovery replaces Enterprise, which has take up its new residence in New York City at the Intrepid Sea, Air and Space Museum. Endevour still awaits its final flight to Los Angeles where it will be on display at the California Science Center. Atlantis, the last shuttle to fly in space, will remain in Florida at the Kennedy Space Center with each representing a fantastic era in the history of space exploration and human ingenuity. The Space Shuttle programme has a legacy going back nearly 45 years, to even before the Apollo Moon landing in 1969. However, it was not until 1972 when President Nixon announced that NASA could proceed with the development of a reusable Space Shuttle that the Shuttle program was formally launched. In the post Apollo era NASA had to, like a number of organizations, take huge budget cuts in the wake of victory. The idea for the Space Shuttle first appeared as a footnote in a much larger program designed to go to Mars, which due to budgetary constraints was slashed, much like we are seeing today. The Space Shuttle was a cost effective way for the Air Force to launch reconnaissance satellites and as a joint project to build a space station to further scientific exploration. 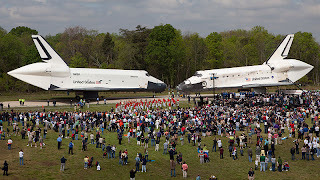 It was not an easy road for NASA, and the Space Shuttle we know and love today is the final result of a 3 year battle against the United States Office of Management and Budget, in an effort to bring costs to a minimum. The first Space Shuttle launch occurred on April 12th 1981, on the 20th anniversary of Yuri Gagarin’s space flight. It was NASA’s first fully functional Shuttle Orbiter and it was called Columbia, after the American sloop Columbia Rediviva, which was the first American vessel to circumnavigate the globe. The STS-1 orbital mission was piloted by Robert L. Crippen, a rookie astronaut, and commanded by John W. Young, who was the ninth man to walk on the moon and the veteran of 5 space flights. By 1985 the Space Shuttle Orbiter fleet consisted of four reusable Shuttles (Columbia, Challenger, Discovery and Atlantis), and the original prototype (Enterprise). On January 28th 1986 disaster struck as the Challenger Space Shuttle exploded on its ascent killing its crew of seven just 73 seconds after lift-off. Using the spare parts originally intended for the other orbiters the Space Shuttle Endeavour was born; it had its first launch in 1991. The next milestone in the history of the Space Shuttle, once again unfortunately comes with disaster, when on the 1st of Febuary 2003 the Space Shuttle Columbia was lost during re-entry into the Earth’s atmosphere killing another seven brave crew members. Columbia was never replaced, leaving three main orbiters in the fleet. 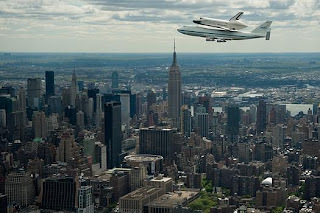 Atlantis took the final Space Shuttle flight in July 2011. The STS-135 mission made the last Space Shuttle supply run to the International Space Station with a crew of just four astronauts. On July 21st 2011 the Space Shuttle made its last landing at the Kennedy Space Center. A total of 1,320 days, 1 hour, 32 minutes and 44 seconds were logged by the Space Shuttles over 134 flights (notably STS-13 was skipped as after the Apollo missions it was considered unlucky). If you are a fan of the Space Shuttle program or just followed its missions briefly, thinking back you will probably remember both the programs triumphs and unfortunate disasters. Having been born 3 years after the Challenger disaster, my memory of the Columbia mission is the pinpoint where I trace events from. Being a big lover of the space program that date is as clear in my mind as 9/11, and although it marks a terrible point in history, it is also an important part of the legacy of a program which has allowed us an unprecedented level of discovery and knowledge. I will leave you with the words of Chris Ferguson, the commander of Atlantis’s STS-135 crew, as Atlantis came to a stop on the runway. "Mission complete, Houston, after serving the world for over 30 years, the shuttle has earned its place in history, and it has come to a final stop."